The conclusion of the tutorial covers labor costs and recommendations for using panic buttons for robberies, safe rooms, freezers, PERS and video integration. An example of covert appearance and secret operation is a foot rail since an adversary can neither see the device nor its activation. An example of covert appearance and non-secret operation is a hold up button since an adversary may overlook the inconspicuous device but can see if a person activates it. Overt appearance and secret operation - some high risk locations such as check cashing businesses in high crime neighborhoods mount a regular emergency button right next to, or underneath, the cash drawer. In these instances, speed is judged more important than covert appearance. Employees of these businesses practice pressing the button without looking and with one hand in the air, until they can activate the alarm while giving the appearance that they are merely opening the cash drawer. Overt appearance and non-secret operation - an emergency button that can be quickly activated with the palm of an open hand is used when the user may have time before an adversary can notice a force them to stop. The most common panic button is a hold up button. A hold up button consists of a recessed button in a plastic or metal housing, connected to an NC circuit. Pressing the button causes the zone to open momentarily. The switch's small size means it can be concealed under a counter or in the kneehole of a desk, and the recessed housing makes it harder to press accidentally. A covered switch should be used where a user would be able to see or be aware of an adversary before an adversary would see them. Examples are supervisor's offices, guard shacks, and security rooms. Some panic buttons require a user to insert a finger into a recess in order to press the button. Others require the user to insert their finger into a hole and lift the button. Either way, the idea is the same: prevent accidental activations by requiring the user to purposefully perform an action before the switch will activate. Uncovered panic buttons, also called emergency buttons, are designed for applications where accidental activation is less of a concern than speed of response. For example, mounting an emergency button on the wall next to a front desk allows a security officer or receptionist to immediately call for help without having to negotiate the button recess. The second or two that is saved may be all that allows an employee to send a call for help. Emergency buttons are also good for applications that do not require covert activation. For example, bank vaults, walk-in freezers, and cash cages are all common locations for emergency panic buttons. Emergency buttons are commonly seen around powered machinery, where they are known as emergency stop, e-stop, or kill switch buttons. Schools often see panic buttons activated as pranks, and latching switches at least narrow down the precise device that was activated, helping security departments or school administration figure out the party responsible. Latching switches are covered switches that lock into place when activated. They must then be reset with a key before the zone can close again. This is to make it obvious which switch was pressed. If latching switches are used, reset keys must be kept in an accessible location and security or maintenance departments must know where the keys are kept and how to reset the switch. Otherwise, they will not be able to reset the panel. Personal Emergency Response Systems: Older adults who are at risk for falls or heart attacks can live independently while retaining the ability to call for help anywhere on their property. Some keyfobs come with fall detection as well as a pushbutton. Lone workers: Employers have a legal responsibility to ensure the safety of their employees, including those who work alone in a fixed facility. Having an electronic device that allows workers to call for help even without cellphone reception ensures that a worker will not be alone in an emergency. Roving workers: Workers who are constantly on the move but may still need to call for help should be issued wireless remotes to carry. Examples include patrolling security guards and warehouse workers. 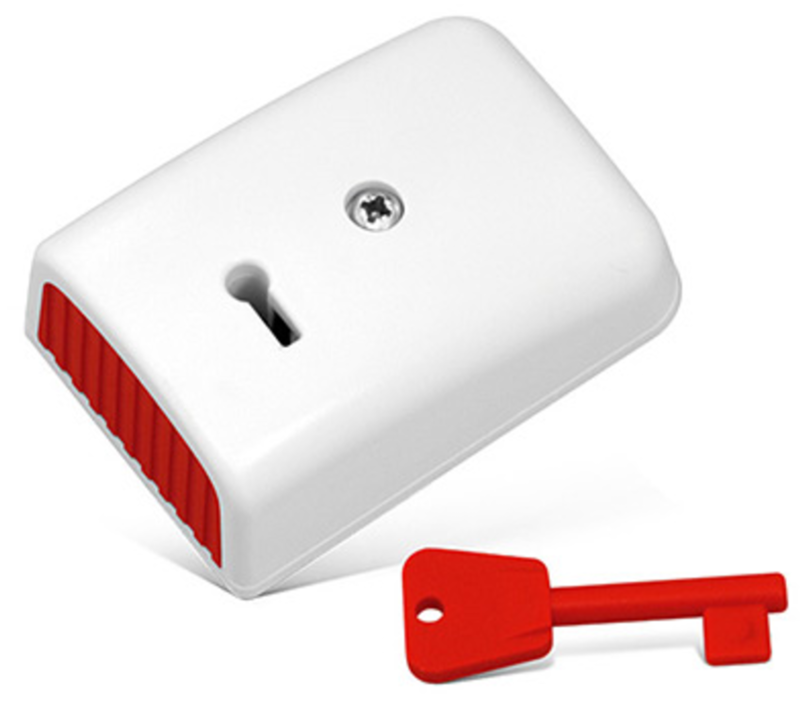 When using wireless remotes, installers must walk-test the keyfob everywhere the alarm subscriber expects to be able to use it. If a keyfob cannot reach the wireless receiver, installers should add a wireless repeater before a customer attempts to call for help from a dead spot. Foot rails can be activated secretly by stepping or lifting with a user's foot. They are mounted on the floor, usually underneath a desk. They are popular with banks as they can be activated while the user's hands are raised or otherwise engaged. The most common type of foot rail requires the user to place their foot underneath and then lift up, as in the image to the right. Foot rails are good for alerting police to note passers, a form of bank robbery where a criminal passes a note to a teller demanding money. Bank tellers are typically trained to hand the contents of their cash drawers to note passers without resistance. A money clip, also called a money trap, is two contacts on a spring. Inserting a bill between the contacts prevents the contacts from touching. A money clip is mounted inside a cash drawer. 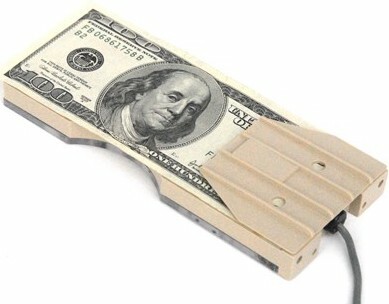 A money clip takes even less presence of mind to activate than a foot rail does, and works even if an adversary empties a cash drawer themselves. Holdup switches themselves are quite inexpensive, usually priced at less than $25. However, installers can only choose a panic button style and location after a long talk with the customer about their needs. Actually running a wire and installing a panic button is usually a simple matter unless the panic button is inside a vault or walk in freezer. The challenge for installers is choosing the particular type of panic button, choosing a spot for the panic button, and training the customer and their employees to use the hold up button effectively. This requires a deep understanding of the customer's operations and industry, which only comes after close coordination with the customer. Because the alarm company will usually not be able to train future employees in using the holdup button, they must "train the trainer" when turning the system over to the customer. Best practice is to prepare detailed written procedures for the customer to show their future employees. All this takes quite a bit of time for a knowledgeable alarm technician to accomplish, which means that any alarm system that includes panic buttons must be priced accordingly. Panic buttons and hold up switches are meant primarily for customers with higher than average security needs. Customers who expect to be faced with an adversary can benefit from panic buttons. Most police departments take multiple or repeated panic button activations seriously, which is why the installer should be sure to identify the zone on the central station monitoring contract as a panic zone. Alarm customers who commonly purchase panic buttons include, banks, convenience stores, jewelry stores, check cashing stores, pawn shops, and other retail stores at risk for armed robbery. Residential customers who own or are considering installing safe rooms should have panic buttons installed in their safe room, and have a wireless keyfob to carry. Panic buttons in safe rooms should be wireless. 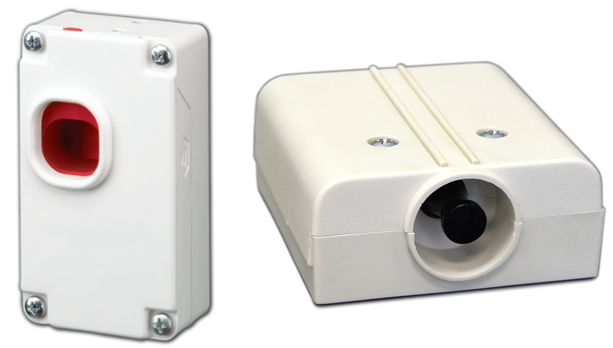 If a wired panic button is required because the safe room construction blocks wireless signals, alarm installers should coordinate with the safe room builder to run protected conduit for the panic button and landline telephone. Restaurants, hotels, and other customers in the food service industry may want to install panic buttons inside their walk in freezers so that trapped workers can call for help quickly. While many walk ins have door release mechanisms on the inside, not all do. Inner releases are not required everywhere, and inner releases have been known to break, trapping kitchen workers inside. When installing a panic button inside a walk in freezer, be sure that the operating temperature of the panic button is within the normal operating temperature of the walk in. Also, installers should have an audible and visual notification in addition to central station notification, allowing any kitchen workers on site to open the door. Best practice is to install a strobe light directly outside the freezer, allowing responders to go directly to the freezer and free the trapped worker. Older adults who are at risk for falls or heart attacks can use wireless remotes to call for help even if they cannot reach a phone. Installers can program these zones so that they send a unique signal, allowing the central station to dispatch an ambulance instead of or in addition to police. Some alarm companies offer PERS (Personal Emergency Response Systems) as a separate service, billed in addition to the regular monitoring service. These alarm companies usually work with central stations that offer PERS, with two way audio confirmation and specially trained responders who can talk an alarm subscriber through a medical emergency. When recommending panic buttons to commercial customers, alarm installers should offer to tie the panic button to the surveillance system. Wiring a hold up button directly into an IP camera or DVR that offers dry contacts allow the recorder to bookmark the activation as an event, making it easier for security officers to search for and save video of the event. A savvy alarm salesperson can thus offer an entire surveillance video system as an accessory to the alarm sale, or an entire alarm system, including the RMR that comes with an central station monitoring contract, as an accessory to the surveillance video system sale.